Here at ReviewTrackers, we are committed to helping businesses transform the customer experience — by making it easy and simple to track, manage, and analyze online reviews and customer feedback. As part of this commitment, we have been working with Hootsuite to bring the best customer feedback management experience to the world’s most widely used social relationship platform. The ReviewTrackers app in the Hootsuite App Directory is designed to support marketing and customer experience professionals as they uncover actionable insights from customer feedback across all major review sites, including Google, TripAdvisor, Facebook (Facebook Reviews), Foursquare, and Zomato. By installing the app, you can create a Hootsuite tab with streams that display your business’ online reviews and customer feedback, alongside social media comments and signals. View your online reviews in a Hootsuite stream, with filtering options for organizing and managing all the customer feedback you care about. Sort and search for online reviews by the groups and locations you have created. Sort and search for online reviews by status label (In Progress, Responded, Do Not Respond). Add your own notes to ReviewTrackers from your Hootsuite dashboard, so you can stay updated, save your responses, or share additional information to your team. The notes you add on ReviewTrackers are also synced with the review data displayed on Hootsuite. Assign tasks to team members so they can respond to and manage new reviews of your locations, directly on your Hootsuite dashboard. Share your best reviews across your social media pages and profiles, including Twitter, Facebook, LinkedIn, and Google. The ability to manage online reviews on Hootsuite — using ReviewTrackers technology — is one of the features our customers have been asking for. With 88 percent of consumers relying on online reviews in order to determine the quality of a business, ReviewTrackers helps companies listen to, manage, and respond to what their customers are saying online. More importantly, ReviewTrackers provides the data and insights companies need in order to understand customers better and deliver optimal customer experiences. 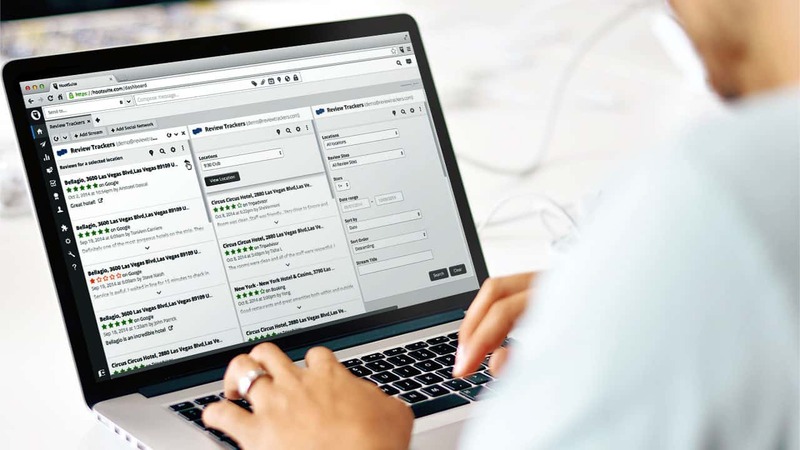 Transform the customer experience and start managing online reviews on Hootsuite using the ReviewTrackers app. On the search box for App Directory, type in “ReviewTrackers.” Alternatively, you can find and read more information about the ReviewTrackers app by navigating to http://apps.hootsuite.com/158/review-trackers on your browser. Once logged in, you can create a new Hootsuite tab and streams for managing your online reviews. You can also add a stream for your reviews to an already existing tab. Any stream you add using the ReviewTrackers app gives you the option to choose the reviews that you want that stream to display. To choose, just click the Magnifying Glass icon on top of the stream. From the dropdown menu that appears, you can choose to view reviews based on business location, online review site, star rating, and date range. To use the ReviewTrackers app on Hootsuite, a ReviewTrackers account and Hootsuite account are required. Don’t have a ReviewTrackers account yet? Create your account today by signing up for a free demo. ReviewTrackers is the award-winning customer feedback software that helps businesses transform the customer experience. The platform collects review data from 80+ review sites to surface customer insights that enable brands to listen to and understand customers, and make data-driven decisions about what they truly need or want. Trusted by over 50,000 businesses, ReviewTrackers helps busy professionals save time, money and resources so they can focus on what matters most: their customers. These are all wonderful features that can help any business optimize their online presence. I think monitoring reviews can sometimes be a daunting task simply because there are so many different sites. Review trackers makes all that information easy to find in one location and really makes the process much simpler so you can focus more time on your business.